Subscription e-commerce, led by start-ups such as Dollar Shave Club, Blue Apron meal kits, and Stitch Fix personal styling, is a fast-growing new way of buying online. McKinsey’s research shows that 15 percent of online shoppers have signed up for one or more subscriptions to receive products on a recurring basis, frequently through monthly boxes. Subscription e-commerce services offer these consumers—often younger, affluent urbanites—a convenient, personalized, and, often lower-cost way to buy what they want and need. The subscription e-commerce market has grown by more than 100 percent a year over the past five years. The largest such retailers generated more than $2.6 billion in sales in 2016, up from a mere $57.0 million in 2011. Fueled by venture-capital investments, start-ups have launched these businesses in a wide range of categories, including beer and wine, child and baby items, contact lenses, cosmetics, feminine products, meal kits, pet food, razors, underwear, women’s and men’s apparel, video games, and vitamins. The coffee subscription is one of the top-selling subscription products. If you are a coffee seller, the subscription e-commerce model is for you. Your customers won’t have to think about whether they have coffee in their homes or offices. The customer will subscribe to its favorite coffee according to the frequency of its consumption, and his coffee will always come to his door. You can also make some sort of surprises to make your customer happy with gifts in the box. With this great structure of the subscription, both your customers will have easy access to coffee and you will have a regular cash flow. One of the most suitable products for the subscription model is the diaper. When you have a child, you are going to use the diaper for a couple of years. You should always think about buying the diaper and you have to do this over and over again. So how about subscribing to the diaper? Once you’ve subscribed, don’t ever think again until you decide to stop using the diaper, so your diaper will come to your door at regular periods that you want. If you are a diaper seller, you should think about the subscription e-commerce model. 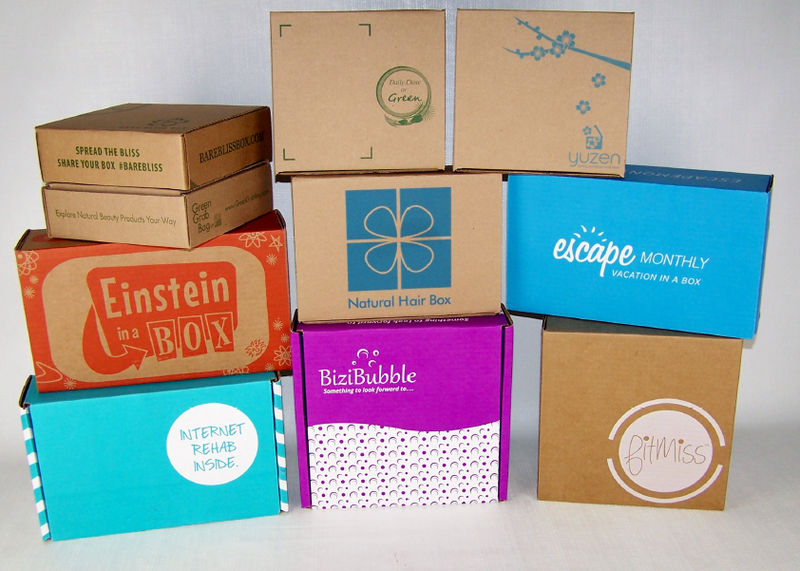 What is the period of a subscription box? How long a product is consumed may vary from customer to customer. A customer can purchase a coffee box and finishes in 1 week and another customer can finish the same box in 1 month. That’s why you need to offer different subscription period options to your customers. The frequency of repeating your subscription box is called a period. For example, you can offer your coffee subscription box to your customers with weekly, bi-week or monthly period options. You can take a look at Unibble that is one of our customers. 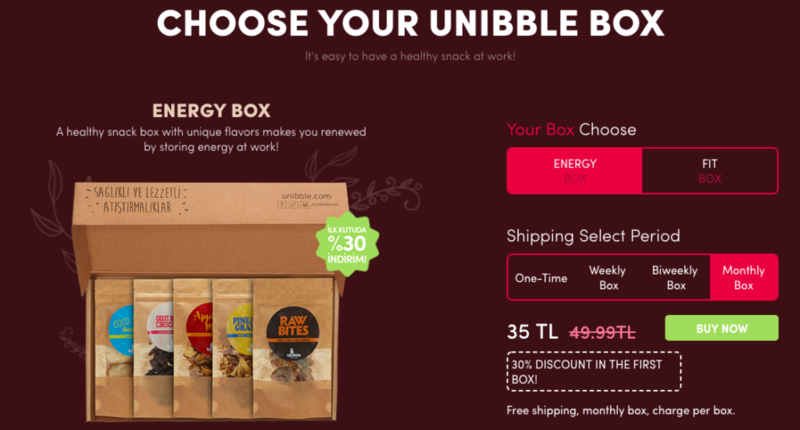 Unibble is selling a subscription box that includes healthy snacks. You can buy Unibble’s box for only one time to test it, also you can subscribe weekly, bi-weekly or monthly. As you see, there is a part that you can select your period; One-Time, Weekly, Biweekly or Monthly. What about our subscription e-commerce customers? Unibble sends healthy snacks boxes to its subscribers. Letspepbox sends a surprise box for women every month. TEDxIstanbul sends a box that includes 3 books every month, the books are chosen by famous curators. Bardabas and Bonininkutusu send an activity box for children every month. Would you like to start a subscription business? As Zerobuffer, we have great know-how about subscription e-commerce, you can check our portfolio to see the subscription businesses that are developed by us. If you want to start a subscription business, just contact us. You focus on your business, technology and subscription platform are on us!